So sorry I missed my letter to you in February! Without wishing to make excuses, it’s down to an incredibly busy month or two …and it seems there’s worse to come! Let’s begin with the couple of weeks away we had- a few days in each of Iceland and Devon, both very snowy and windy as it turns out! Our return to Iceland some 34 years after our first visit (in the summer), was something of a ‘saga’ you might say, mainly down to bad weather affecting both of our flights, to the effect that we had added an 8 hour coach journey each way due to flights being diverted. And the return leg was further complicated by bad weather at our new airport destination (Keflavik)…this resulted in a day’s delay and further complications which all in all rather over shadowed the wonderful experience of northern Iceland in winter. As you can see the upright I had to fix in concrete hasn’t survived the winds and so its back to the drawing board; I think I’ll level off the base with mortar and drill some pilot holes for the bolts, then try placing these in a resin compound that my builders’ merchant says will ‘do the trick’! We shall see…. ‘m getting a bit anxious about all the things building up for me in the next few months, not least remodelling our lounge (just had a bit of a shock with the builder’s quote on this) and getting the place ready for our Daughter Lindsey’s wedding reception…and of course all the other arrangements that go with this! Add to this my usual round of Green Flag judging (I have 4 parks and open spaces to visit in London, including Clapham Common, plus two in East Anglia) and a new project; I’ve been asked to help the Grow Organisation with a design for a show garden at the Sandringham Flower show on the theme of ‘A young person’s journey to wellbeing’. This is being commissioned by The Prince’s Trust. This is an exciting prospect as I will be working with a group of young people to co-design and co-produce the garden. Volunteering at Blickling Hall continues and most recently I had a very pleasant few hours edging the paths with some of the other volunteers. As you can see there’s also a lot of work being done to restore the Orangery- I had an interesting chat to one of the workmen, who explained how badly decayed a lot of the woodwork is, but it will look splendid once more, in the, hopefully, not too distant future! And I’m very pleased to report a great success for the Reepham High School and College Allotment Project, where I’m one of the community volunteers; they’ve just won the Norfolk and Norwich Eco School award, which is very well deserved as it is fast becoming a major centre of school and wider community life, exemplifying the principles of permaculture and recycling. I was pleased to be involved in the visit of the Orchards East project, three of whose personnel came to see the orchard and provide some very useful advice on pruning and management; hopefully they can help out with some extra fruit trees next winter to fill a few gaps and diversify the types of tree in the orchard. So, once again sorry for missing you out in thedepths of winter, old friend; I was pleased to hear that our mutual mate, Les popped in to see that you and Ferdy were keeping well, and I gather he stocked you up with food and few beverages when you were snowed in, too! You can probably tell my anxiety levels on on the rise, so hopefully by next month I will be able to report some real progress in Old School Garden as well as in the many other areas of my horticultural life! Keep well! Having finally completed this years work at the local church I can now turn my full attention to Old School Garden. But I’ve been feeling a bit tired and lacking strength recently, perhaps a hang over from the chest infection I couldn’t seem to get rid of, or that and all the physical efforts at St. Peter’s? The restructuring of the Kitchen Garden is progressing, albeit rather slowly. I’ve completed the boxing in of the oil tank, and in the last couple of days have dug up the remaining old raspberry plants and cleared away a site and replanted the blackberry bush….this will now be positioned to run along the edge of the wood on our northern boundary. I’ve also laid the remaining slabs at the rear where the new shed will go (I’ve made a start on cutting the wood for the base and frame for this, but I’m thinking it may be the Spring before this is completed). I’ve also repositioned the compost bins so that they take up less space in the working areas of the garden. The ‘great leaf collection’ has begun too..a job that seems never-ending as the last trees to lose their leaves (usually the oaks) continue to shed their golden foliage. The western boundary has been fully cleared and there are just a few bits and pieces of wood etc. that need tidying up, this will open up the edge of the garden to more light so opening up new planting possibilities. I hope that if the weather is kind, I might get the trellis work relocated in the next month or two, which will also enable me to prepare the old raspberry bed for a new planting of potatoes in April. My input at the local High School continues and even though the lunchtime sessions are short we manage to get a reasonable amount of things done. Last week I joined two lads in constructing a low raised bed which will expand the planting possibilities at the Allotment Project. A new raised bed created in just 30 minutes…. I’m still doing about a day a week at Blickling Hall, and am conscious I haven’t posted much about this of later. needless to say there is a lot or repetition as the seasonal jobs roll around. I’m looking forward to visit the gardens nearer Christmas, having seen the enormous effort being put in to lighting up the grounds- it should look spectacular. I’ve run my two shredders over the Grow organisation as I think they will make better use of them than me, and it wa pleasing to see that the project is really taking off now that it has a steady set of staff and a good number of volunteers and participants on its ‘green therapy’ sessions. As you were there you know how successful our Remembrance Day event at the church was, with nearly 300 people attending and wide range of activities and features. You can see photos a report and also an ITV Anglia News item on this on my sister site www.haveringland.wordpress.com. Having realigned a few of the trees in the ‘Avenue of Remembrance’ the setting of the church is much improved and the ornamental pears ‘Chanticleer’ have begun to turn a cockscomb red as their name suggests. Well Walter, as the days shorten and the weather worsens I guess it will soon be time to curtail my gardening activities, but hopefully we will still have some days when- if other activities allow- we can get out and continue the restructuring of the Kitchen garden so that its ready for the finishing off in the spring. I hope that you and Ferdy are getting prepared for Christmas. we visit my mother in Law shortly in devon for a few days and after that we will be into December and the preparations can seriously begin! I trust that Lise and you had a good Christmas. We certainly have, with our children and their partners with us to share good food, drink, walks and talks. Here’s a picture of them all outside Blickling Hall on Christmas Day. In Old School Garden, I’ve been continuing the tidy up, with most of the remaining leaves collected and stored, as well as some long overdue weeding and plant dividing and moving. We have also been harvesting parsnips, chard and leeks for the festive meals and , as hoped, the ‘Red Delicious’ apples I stored have ripened in time for Christmas. The weather has offered up some mild, dry days but of late ‘real’ winter has descended with frosty, foggy days. Coupled with the weather and the festivities I seem to have developed a problem with one of my hips which has also prevented me from doing as much outside as I’d hoped. A trip to the doctor indicates inflamed muscles and ligaments, so for now I’m taking anti inflammatories to try to reduce the problem, pending an X Ray to make sure nothing more long term is the cause of the problem. To date, the medication seems to have had little impact, so my days have been uncomfortable and at nighttime my sleep has been disrupted. Still, garden- related activity has continued….I’ve drawn up my planting plan for the Kitchen Garden in the coming year (see below). During the tidy up I’ve noticed very few stems on the summer fruiting raspberries, so it may be that a move of these is called for as harvests have been disappointing in recent years, despite some new planting in gaps left by older plants. so the plan may need a more radical approach in the next couple of months; weather and hip permitting! Apart from this I’ve had some meetings at ‘The Grow Organisation‘ in Norwich; you remember I mentioned this social enterprise and it’s plans to create a ‘Green Care’ centre? Below is an aerial picture of their site and a shot of the concept plan I’ve produced. We’ve had two very promising meetings with Garden Organic and the Mental Health Foundation Trust I’m involved with as a governor. I’m pleased to say both organisations are fired up by the plans and have agreed to work with us to make the vision a reality and get a range of gardening therapy courses and activities underway. Staff are now seeking outside sponsorship and other funding routes to get phase one of the plan completed; this involves creating a number of raised beds and vertical gardening structures on what is currently a tarmaced basketball/football court. And alongside we hope to build a sunken greenhouse and cold frames, and create an outside working space (including a compost demonstration area) next to the existing potting shed. This is an exciting opportunity which I plan to continue to help in the coming year. Oh, and do you have any spare garden equipment or tools you could pass on, please? The Allotment Project at the local High School has put out a request for these, so if you or someone you know has things they can spare, please let me know. I plan myself to let them have a wheelbarrow and few tools that are surplus to requirements here. In a couple of weeks I’m giving a talk to the Lindfield Horticultural Society down in Sussex, courtesy of my old friend Jen and her brother, Chris, who is their Chairman. The topic is ‘Heritage Gardening’. Apart from drawing on my own experience and training in this field (especially my time at Blickling Hall), I plan to feature some unusual examples of heritage gardening from around the country and beyond; and some fun activities too! I’ll let you know how it goes in my January letter to you. Once this is out of the way, I plan to devote more time to researching the Tree Trail at Blickling, and hopefully finalise the content of this to enable us to move into production of the tree information signs and associated leaflets and other paraphernalia. This will include some ‘leaf stamps’ for children to use as they visit a few of the commoner, native trees. Fingers crossed; I hope to have the bulk of this completed by the time I write to you again in a month’s time. Until then Deborah and I wish you and Lise an enjoyable New Year celebration, and more importantly, a thriving 2017! I hope this letter finds you and Lise well. Some wintery weather has descended, but I’m pleased to report a reasonably productive month in Old School Garden. I’ve collected a lot of leaves, mainly by using the ride-on mower with it’s grass collector. In fact I now have a full leaf compound, so will have to pull the various subsidiary mounds around the garden into my main store once this has rotted down a little. I’ll also need to get cracking with the leaf fall in the pond and borders in due course, but as I write, the oak trees are only just beginning to colour up and lose their leaves, so we’ve a way to go, as usual..
Having also cleared out the furniture store (this performed well as a temporary ‘Cat Cave’ for my daughter and son-in-law’s cats for a couple, of months), I now have a large wooden and metal mesh door that I’ve taken off of it’s hinges and can use as a front screen for the leaf compound; so a good example fo recycling (or is it ‘up’ or ‘down’ cycling?). The outdoor furniture is also safely stored for the winter. I’ve been busy clearing and lightly digging over most of the kitchen garden, and got my onion sets and broad beans sown. On the day that the first frosty night was promised I also managed to clear the greenhouse and rehomed winter-tender plants such as the Cannas (we had a pretty good show from these), various bedding plants (we’ll see if it’s worth hanging on to these) , Echeveria and Pelargoniums. The vine in the courtyard and some climbing roses and clematis have also had their winter tidy up. And as containers have been cleared I’ve filled them with bulbs along with some winter bedding in the form of Cyclamen, Pansies and Violas. I’m pleased with the various Candelabra Primula I’ve grown from seed, and now planted out most of these in the Pond Garden and one or two other shady spots (and given some away). I look forward to a good show in the spring. I’ve also planted out the various Achillea nobilis ‘Neilreichii’ runners (courtesy of the Walled Garden at Blickling), in the two triangular raised planters next to the terrace; once bulbs for spring interest have finished here, these should help to give a good summer show of short, creamy white flowers and bluish grey cut foliage. You recall I told you about clearing the front border under our bedroom window? Well that too has been planted up with the English Lavender I bought and brought on together with some spring bulbs, Scabious and Potentilla rupestris all grown from seed. 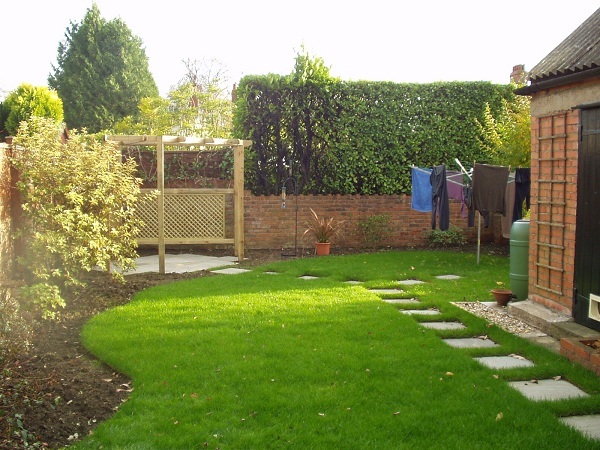 See the picture below- eventually I hope that the lavender will fill out to a low hedge at which point the other plants can be moved on. I still have some other plants to put out, hopefully before the weather turns very cold. My last harvesting is nearly done- just a few parsnips, leeks and chard left for later. The ‘Red Delicious’ apple tree seems to have produced a good crop this year so I’ve got a large box of these in store; they should fully ripen in time for Christmas. You’ll be aware of my involvement in the Allotment Project at Reepham High School & College, where there may be an exciting development in relation to sponsorship and involving produce being used in local hotels and pubs- more on this in due course if it comes to anything. My other active project at present is the ‘The Grow Organisation’ near Norwich, where I’ve completed a Concept Plan for them. This appears to have gone down very well, including with some potential partners in Mental Health Services. You may recall that the organisation is providing gardening and food growing opportunities for people with various needs, including some with mental health issues. The vision is ambitious and includes the progressive, incremental development of the site into a number of different areas, many involving food growing, and also including a ‘Trials Area’ where permaculture and other techniques can be explored. I’ve also included a sunken greenhouse (to allow round the year growing) and a demonstration compost area, where I hope we can get support from national and local composting projects. I’ll keep you posted on the developments here. My desk research for the Tree Trail at Blickling continues. My latest session included the Sycamore (Acer pseudoplatanus), perhaps considered a bit of a thuggy weed in some woodlands, but also a great tree with some interesting history. Apart from being used as a gallows in Scotland due to its strength, there is a famous example in Dorset- The Tolpuddle Martyrs’ Tree. Under this sycamore tree at Tolpuddle, six agricultural labourers, known as the Tolpuddle Martyrs, formed an early trades union in 1834. They were found to have breached the Incitement to Mutiny Act 1797 and were sentenced to transportation to Australia. The subsequent public outcry led to their release and return. The tree now has a girth of 5.9 metres (19 feet, 4 inches) and a 2005 study dated the tree to 1680. The tree is cared for by the National Trust, so this little bit of history is a ‘must include’ in the Blickling Tree Trail! The Martyrs’ Tree, Tolpuddle, Dorset. Picture by Simon Palmer. I heard the other day that the Met Office is saying that the growing season here has been extended by a month, due to global warming. Certainly, as I walked around Felmingham and North Walsham the other morning it was amazing to see how few trees are anywhere near bare of leaves, and there’s still so much green around! I guess that I’m feeling as though I’m in a false sense of security, as it doesn’t seem at all urgent that I get on with planting bulbs and the perennials I’ve been nurturing in pots, sowing Broad Beans and onion sets or transplanting tender plants into the greenhouse. Of course I’m probably going to fall prey to a sharp frost anytime now and I’ll be shocked into the reality that it’s winter..well, it will be soon, as the clocks go back an hour tonight. I look back and once more think about all that hasn’t been done in Old School Garden this month. Still I suppose a few important jobs have been ticked off- like putting in a new fence post and mending and creocoting the fence, gate posts and garden gate, cutting the grass and gathering leaves, putting out the first lot of bird food, weeding around the leeks and continuing to gather produce, especially apples and carrots. I’ve also cleared the front border (just below where we had the paint removed from the house flintwork) , levelled the edging, started to top up the soil and will eventually plant out a row of English Lavenders I’ve been growing on in pots, together with some Scabious grown from seed and some bulbs for spring colour. This will eventually be a Lavender hedge which should grow go well on this south-facing (if part shaded) wall. I’ve also had a plant exchange with my friend Mandy; she’s given me some Veronicastrum virginicum ‘Fascination’ and Euphorbia seguieriana. 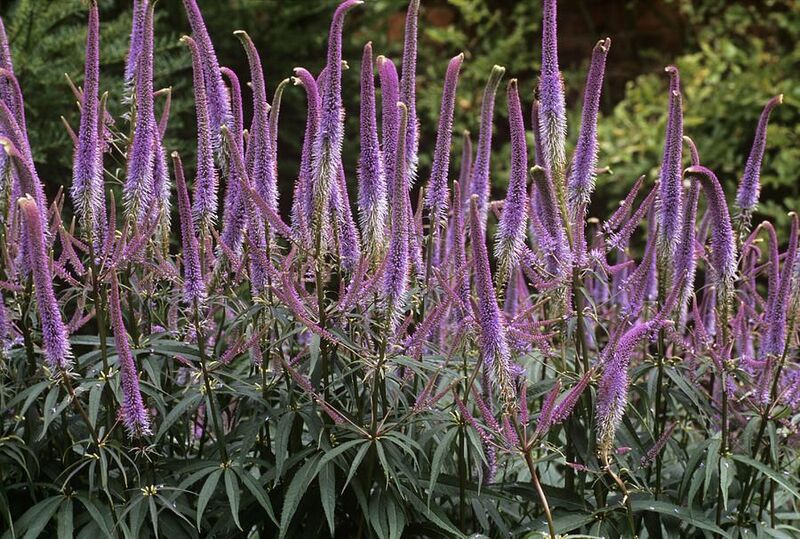 The former is a hardy perennial with pale lilac flower spikes that become ‘fasciated’ (the stems and flower spikes flatten and twist into strange shapes) and so are rather curious to look at. I love Veronicastrum and look forward to growing this- perhaps alongside the two tall pale yellow Scabious I’ve grown from seed this year and which are also ready to plant out. I gave Mandy a few Candelabra Primulas (also grown from seed) in return. I have rather a lot of these and have been thinking about where to put them; apart from around the pond garden that is, where they were initially intended to go. I think I’ll try a few in the triangular raised beds we have next to the terrace, perhaps mixed in with the Achillea nobilis ‘Neilreichii’ I’ve grown on from runners harvested at Blickling along with some more spring bulbs. I also think I’ll try some in the ‘plant theatre’ in the courtyard garden, in advance of the pelargoniums that normally make for the summer show. As you may have seen I’ve been active on other fronts gardening-wise. A spent the first of what I hope will be regular sessions at the local high School Allotment Project, where the enthusiastic Mr. Willer is getting great results from the garden and pupils. I’m also drawing up a design for the ‘The Grow Organisation’ near Norwich, which is providing gardening and food growing opportunities for people with various needs, including some with mental health issues. This is exciting, the first bit of garden design I’ve done for a while! finally, the ‘Friends of Haveringland Parish Church’ have just about completed the first stage of turning over the churchyard to a managed conservation area with mown paths, easy access to still-tended graves and to provide a wildlife haven that’s also somewhere beautiful for humans to sit and reflect. Finally, my regular (well, pretty irregular recently) sessions at Blickling continue and apart from the practical gardening work I’ve begun to research the information for the new Tree Trail I’m designing there. this is throwing up some fascinating information; e.g. did you know that the ‘Monkey Puzzle’ Tree (Araucaria araucana, beloved of Victorian gardens) gets its common name from a chance remark made back in 1850? Sir Willaim Molesworth, the proud owner of a young specimen at Pencarrow garden near Bodmin, Cornwall, was showing it to a group of friends, when one of them (the noted barrister Charles Austin), remarked, “It would puzzle a monkey to climb that”. As the species had no existing popular name, first “monkey puzzler”, then “monkey puzzle” stuck! Though I haven’t yet had another go at that shredder, it has at least been a month of some progress in Old School Garden and beyond. I must quicken the pace to make sure all those late autumn/early winter jobs are completed soon, before the weather finally breaks..or will it be early autumn well into November? So, autumn is upon us! It’s been an interesting gardening month for me here in Norfolk, though I have to say spending rather more time on gardens and gardening projects away from Old School Garden. That of course has made me feel a bit guilty, and with the damage done to the grass (I’ve given up calling them ‘lawns’) by the new brood of young moles, also rather dejected and overwhelmed with all that needs doing. I have at least continued to harvest fruit and veg from the garden; the apples and pears are especially pleasing, and the cucumbers are beginning to overwhelm us! Still it’s that time of year when things tend to wind down as far as growing is concerned, and attention turns to selective tidying up and repair jobs. So, I’ve emptied the shed in preparation for constructing it’s replacement, replaced a wooden fence post, cut a shed full of firewood, cut the grass and cleared away the first leaf fall, and watched the autumn colours appear- especially from Asters and Sedums. I also had a frustrating morning trying to get my new shredder working. You may recall that a kindly neighbour gave me this petrol driven machine, which after servicing I was eager to try out. Well, to cut a long story short, whilst I managed to get it going a few times, it kept cutting out on me and on one or two occasions stalled from too much damp, leafy material being fed to it. I gave up in the end and still have the aching elbow joint to prove how many times I yanked the starting cord, to no avail! Away from home there’s been some interesting developments. I visited a social enterprise project called ‘The Grow Organisation’ on the outskirts of Norwich. They provide home garden maintenance services (providing employment opportunities to people who might otherwise find employment difficult) and are hoping to develop the surroundings of their impressive community hub building to provide gardens where people who have a variety of health issues can spend time using ‘gardening as therapy’ ; including a ‘Sensory Garden’ for those suffering from dementia. The project sounds great and having spoken with their Director, I’ve agreed to help them with some design ideas for these outside spaces. The second project is one I’ve already mentioned in my blog- the Allotment Project at our local High School in Reepham. Here teacher Matt Willer has created a wonderful outdoor classroom using materials and other resources either borrowed, donated or upcycled. He’s also used a great deal of ingenuity to overcome some issues such as the lack of a pumped water supply by devising a system for harvesting rainwater and created a well for storing this. The other big story is the success of the Harvest Festival event at our local church, St. Peter’s, where having cleared up the churchyard the week before, around 150 people fo all ages came to see the end of a vintage tractor run, listen to the Aylsham Band, sing some old favourite harvest hymns and take par tin various activities such as making bread and butter, sowing seeds, learning about compost, making their own ‘scrap’ tractors and tucking into some scrumptious tea and cakes. ‘Haveringland Groundforce Day #2’ is now planned for next week, where I hope that we can finish off getting the churchyard set up to become a properly managed conservation area which is accessible and provides a place to reflect and enjoy nature as well as visiting the graves of the recently departed.